Well we ended up short handed on the Trade In today, but we decided to go white marlin fishing anyway. I heard great reports of a marlin bite that was going on for a couple days in the Wilmington Canyon, so we went for it. The seas were sloppy and fishing was tough on the 27′ center console, but we managed to raise some fish. I kept the spread simple only pulling 5 lines and one dredge hoping that would make it easier when the whites came up. Maureen wanted a white marlin for her birthday so she was taking shots at hooking them. We wound up 2/7 and raised 9 for the day. At one point we had a quad but just didn’t have the anglers to rack up the numbers. We were going to stop and tilefish at the end of the lay, but it never calmed down, so we pulled the plug and headed home. The water was a consistent 78 degrees and blue throughout the day, but it never calmed down at all which made trolling back up sea difficult. All of our bites came when I was trolling in the trough against the current making 5 knots. The water was moving West at about .6 knots all day. 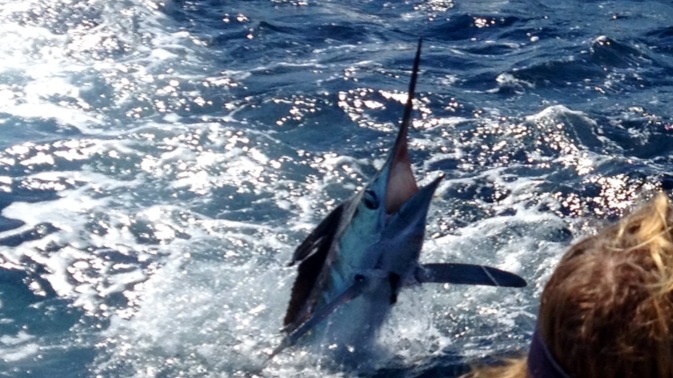 It turned out to be a fun day of fishing, and Mo got two white marlin releases for her Birthday trip.